Neutral bar assembly is manufactured from silverplated radius edged copper. Size of bar is rated 1000A. Per sq./in. Standard comcoded assembly includes mounting insulators, and grade 5 zinc plated bolts and hardware. Provisions for a maximum of (4) copper hypress lug terminations are provided for incoming feeder cables. 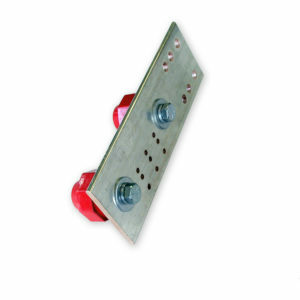 Bar is provided with 3 sets of 1/4-20 tapped holes on 5/8″ and 1″ Centers for load lug connections. Provides the ability for supplying 4 wire loads to such equipment as inverters.